Made with delicious herbs and seasoning. No artificial colours or preservatives. Suitable for vegetarians. There's so much you can do with Paxo. . . 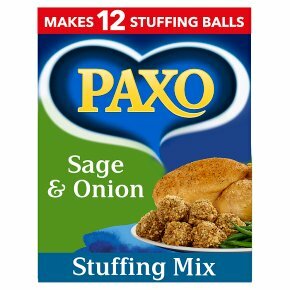 Whether it's baking in a tray, mixing together with sausagemeat or rolling into stuffing balls, Paxo makes your roasts taste fantastic. Paxo offers a great way to add texture and flavour to all kinds of dishes. Why not try serving with pork chops, steaks or fish to add a delicious crunch and flavour. It's also great as a stuffing for tomatoes and peppers for a Mediterranean twist. 1. Pre-heat oven to 220°C, fan oven to 200°C, Gas mark 7.2. Empty the sachet into a bowl, adding 425ml of boiling water, mixing well. Add a large knob of butter if desired.3. Leave to stand for 5 minutes then place the stuffing into either an ovenproof dish or alternatively form into stuffing balls on a greased baking sheet and bake for 25-30 minutes until piping hot.